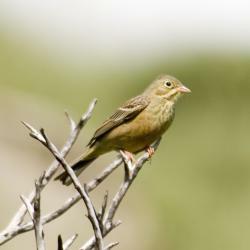 Pass on the ortolan: This song bird is now off of the menus of fine French restaurant. Roasted ortolan used to be a favorite delicacy, but over hunting of the birds has lowered their numbers to endangered status. (Flickr photo by Sergey Yeliseev)Okay, it’s pretty well known fact that Americans and the French just don’t understand each other too well. The fascination with Jerry Lewis is the classic case. Here’s the latest example. The French delicacy of roasted ortolan is being put on hold for a while as the songbird that is used for the dish is now classified as an endangered species. That’s good news for ortolans, sparrow-sized song birds that I’m sure most Americans would ever think of eating. The bite-sized bird is killed by being drowned in armagnac, plucked and roasted with its yellow skin and skeleton intact. The French then shroud their head in a napkin to eat ortolan. But it’s now officially off the menu in France. In 1998 a law was passed to ban the hunting of ortolans. Because the birds are so small, they’re not hunted with guns, but caught in traps hung in trees. Often, a secured male ortolan will be used as a decoy to attract females to the trap. Once caught, they’ll be kept live for a few weeks and fed to fatten them up before being consumed. While ortolans, which migrate between Africa and Europe, are not endangered worldwide, the over hunting in France has greatly diminished their numbers. Penalties for private possession of an ortolan in France are a fine of up to $12,500 and six months in prison. With its new black-market status, a single bird can now fetch between $140-$210. "The French then shroud their head in a napkin to eat ortolan." I eat everything this way. It's like eating inside your very own fort. it weird that people pay $140 to eat this bird because i could buy alot of things with that amount of money!!! what is even more strange that there are other animals that we would consider pets that are delicasies in other countries as well! WOWWOWOWOWOWOWOWOWOW, thanks but no thanks I'll stick with chicken.